Lester Piggott was one the greatest jockeys in turf history. His natural horsemanship combined with his uncanny ability to understand his mount, as well as his mental toughness gave him a clear advantage over ordinary riders. Piggott rode some of the greatest horses of his time such as Nijinsky, Petite Etoile, The Minstrel, Crepello, Never Say Die, Dahlia, Alleged, Ardross, Le Moss and Sir Ivor. The last named was considered by this great jockey to be the fastest horse he ever rode. Clearly to be so highly regarded by such an extraordinary horseman such as Sir Lester, Sir Ivor must have been very special indeed. He was, in every sense of the word. Sir Ivor had it all, explosive blazing speed, a marvellous temperament, class, a smooth action when at full gallop and the best connections a budding champion horse could ever have. So where did all of this brilliance in one horse come from? Sir Ivor was sired by the very good stallion Sir Gaylord. Sir Gaylord was an older half brother to the legendary Secretariat. Sir Gaylord was no slouch on the track as he won seven stakes races as a two year old and three year old prior to the first Saturday in May of his three year old season. Sir Gaylord would not make it to the Kentucky Derby however due to sustaining a hairline fracture of the sesamoid bone in his right foreleg during a pre derby workout. The injury to the Christopher Chenery bred and raced colt ended his racing career. Sir Gaylord began his stud career at Claiborne Farm, moving to Haras du Quesnay in France in 1972, and would be a very good sire. Not only did he sire Sir Ivor, but he also sired multi grade/group one winner Habitat, who in turn became a successful sire, Bonnie And Gay, Gay Matelda, Pallisima, and Gay Style. Sir Gaylord died in France in 1981. The dam of Sir Ivor is Attica, a stakes placed daughter of multi stakes winner Mr. Trouble. He in turn is a son of the epoch broodmare sire Mahmoud. Looking further at the third generation of Sir Ivor we not only see Mahmoud, but also Royal Charger, Princequillo and Pharamond II, all established and highly regarded sires. Sir Ivor had pedigree. Alice Headley Chandler bred Sir Ivor in 1965 at her Mill Ridge Farm in Kentucky. She consigned the bay colt by Sir Gaylord to the Keeneland summer yearling sales where A.B. “Bull” Hancock purchased him on behalf of his client Raymond Guest, the American ambassador to Ireland, for $42,000. Guest then had the colt shipped to his Irish trainer, the one and only Vincent O’Brien, at Ballydoyle in County Tipperary. Sir Ivor was a smart looking youngster, a bit leggy but would fill out beautifully before he made his first race course appearance at the Curragh on Irish Derby day in 1967. O’Brien later said of Sir Ivor that at first the colt seemed a little backward, and he and his staff thought that Sir Ivor would grow too tall to be of any use as a two year old. However the colt stopped getting tall but grew ”sideways” in O’Brien’s words, thus filling his 16.0 hands frame with muscle. On his début Sir Ivor finished fourth, running a bit green. Liam Ward was his jockey that day and he proclaimed to Vincent that this colt will never be beaten by this bunch again. His next two starts also came at the Curragh winning both, which were the Probationer’s Stakes and National Stakes. Each race was a step up in class. O’Brien then sent Sir Ivor to France for the Grand Criterium and enlisted the services of Lester Piggott for the race. The three length victory in the Lonchamps race established Sir Ivor as a very serious contender for the upcoming classics in the following season. Second in this race was Pola Bella, who would go on to win the French Filly Triple Crown the following year. Sir Ivor was named as the champion two year old in Ireland. O’Brien sent Sir Ivor to Pisa, Italy for the winter for the milder weather there as opposed to the colder climates in Ireland during the same time. The holiday did wonders for Sir Ivor. By the time of his three year old début at Ascot for the 2000 Guineas Trial, Sir Ivor was fit and full of himself. The ground that day was very soft for the seven furlong race and Sir Ivor just barely hung on for the victory. There was a fear that the race would exact a great toll from Sir Ivor before the day at Newmarket for the 2000 Guineas. The field was a strong one. Petingo came into the race as the favourite off his stellar two year old displays. Also in the race was Jimmy Reppin who had defeated Petingo in the Wills Mile Stakes. Relaxed and placed in a good spot under Piggott, Sir Ivor hit the gas at the dip, streaking by Petingo and drew of to win by one and one-half lengths, Petingo second and Jimmy Reppin third. Sir Ivor was now a classic winner. Piggott was in absolute amazement about the speed and acceleration Sir Ivor was blessed with. “The colt is so manageable”, said Lester “that I can place him anywhere and he will still fly past any horse in front.” This assessment by Lester Piggott would be put to the test in a dramatic way during the running of the Derby Stakes at the famed and demanding Epsom Racecourse. Piggott held Sir Ivor back in seventh place as the field came around the demanding Tattenham corner and into the long four furlong uphill straight to the finish post. With just over one furlong to go, Sir Lester finally uncovered Sir Ivor and let him loose. They were five lengths behind the leader Connaught when Sir Ivor fired the booster rockets and scorched right past the leader, winning the race by one and one-half length. The popular Raymond Guest was not in attendance that day unfortunately, as he was in Ireland to attend a government function but he did see the race on TV and was able to get to Epsom for the victory party later in the evening. His wife Caroline had the proud honour to lead the Derby winner to the winner’s enclosure and accept the trophy from the Queen. As a side note, Raymond Guest had placed a huge wager on Sir Ivor to win the Derby right after the colt’s first victory the previous year. William Hill took the bet and when Sir Ivor began to show his form, especially after the 2000 Guineas, Hill became very nervous about the large payout Guest would receive if Sir Ivor won the Derby. Hill tried to persuade Guest to reduce the wager, and his anxiety before the race was clearly etched on his face. Raymond Guest would not back down and made a very tidy profit that day. The Irish Derby was up next and O’Brien and Guest were very confident of victory. Liam Ward was O’Brien’s contract rider in Ireland, so he had the mount. Unfortunately, Sir Ivor did not win as Ribero, a very good colt by Ribot, got in front and would not relinquish the lead. Ribero was ridden that day by Lester Piggott, who knew that if kept the stout Ribero up front, his mount had a better chance of beating the speedy Sir Ivor. The tactic worked. Sir Ivor was back in England a week later for the Eclipse Stakes at Sandown. In this race he would face older horses for the first time, but at the ten furlong distance which O’Brien and Piggott felt would be his best distance. The previous year’s Derby winner Royal Palace, a very fast and classy champion, would hand Sir Ivor his second consecutive defeat. Vincent O’Brien then brought Sir Ivor back to Ballydoyle for rest and to prepare for an autumn campaign and a shot at the big prize, the Prix de l’Arc de Triomphe on the first Saturday in October at Longchamps. A prep race was needed before the Arc and O’Brien chose the Prix Henry Delamarre, held at Longchamps one week before the big race. Sir Ivor finished second in the twelve furlong race and got tired near the end. The O’Brien team felt it was a good race to tighten their steed for the Arc. Lester Piggott was back on board Sir Ivor in the Arc and had his mount placed exactly where he wanted but the ground that day was quite soft and the Derby winner was beaten to the finish post by the great Vaguely Noble. As with his loss to Royal Palace, this defeat was certainly no disgrace, since Vaguely Noble was considered as the best twelve furlong horse in Europe at the time. A chance for redemption came in the ten furlong Champion Stakes at Newmarket two weeks later. Sir Ivor dominated the race with his customary blazing sprint in the final furlong to take the win. Raymond Guest wanted to have his champion race in his homeland and so Sir Ivor was off to the US to start in the Washington D.C. International. Soft ground was again the surface for which Sir Ivor had to conquer, but this time he did so most emphatically. Piggott had Sir Ivor in fourth as they rounded the final turn and headed into the short straight on the Laurel infield turf course. Sir Ivor demonstrated his astounding burst of acceleration and left the field in his wake by three lengths. Among the beaten horses that day was American turf champion Fort Marcy. Sir Ivor was named the Horse of the Year in both England and Ireland, and Timeform would give Sir Ivor a 135 lbs rating. Raymond Guest decided that Sir Ivor was to be retired for stud and stood his Derby winner at his Ballygoran Stud in County Kildare. This allowed European breeders a chance to breed to his champion. Sir Ivor would stand his first two breeding seasons in Ireland and then be shipped off to stand at Hancock’s Claiborne Farm in Kentucky. He remained at Claiborne for the rest of his life. Upon arrival at Claiborne, Sir Ivor would be barn mates with some of the elite, like himself, champions of the day. Former Ballydoyle stable mate Nijinsky, Bold Ruler, Round Table, Damascus, Forli, and soon Secretariat would be some of the legends he shared living space with. Sir Ivor would have a major impact on world breeding, especially with his daughters. Ivanjica was perhaps the best racing filly sired by Sir Ivor. This two time champion of French racing captured the classic Poule d’Essai des Pouliches and the Prix Vermeille as a three year old and then topped that by winning the Prix de l’Arc de Triomphe, thus avenging her father’s defeat eight years prior. Ivanjica was bred and owned by Jacques Wertheimer and trained by the esteemed Alec Head, and ridden by Head’s son Freddy. Optimistic Gal won three G1 stakes as a two year old and then backed up her form with three more G1 stakes wins as a three year old. Her two year old G1 wins were the Matron, Selima and Frizette Stakes, adding the Adirondack and Alcibiades Stakes during her juvenile year. At three Optimistic Gal won the Alabama, Delaware and Spinster Stakes, adding the Kentucky Oaks (then a G2 race) and the Ashland Stakes. Godetia won the Irish Oaks, Irish 2000 Guineas and the Pretty Polly Stakes. Cloonlara was a champion two year old filly in Ireland winning the Phoenix Stakes and Probationer’s Stakes. Miss Toshiba (Vanity Handicap), Equanimity (Fantasy Stakes), and Italian champion Ivor’s Image (Italian Oaks, E.P. Taylor Stakes) are some additional G1 stakes winning fillies sired by Sir Ivor. Two more G1 winning daughters of Sir Ivor are Lady Capulet and Sweet Alliance, each of whom became important broodmares. Lady Capulet won the Irish 2000 Guineas and would then produce two champions in Entitled by Mill Reef and El Prado by Sadler’s Wells. The latter was a leading sire and has emerged as a sire of sires due to the exploits of his sons Kitten’s Joy (leading sire in North America), Medaglia d’Oro (sire of Rachel Alexandra, Marketing Mix etc), and emerging young sire Artie Schiller. Sweet Alliance was purchased as a yearling by Windfields Farm and raced in the turquoise and gold colours of that famous stable. She would produce a bay colt by Northern Dancer in 1980 for Windfields. The colt was consigned to the Keeneland July yearling sales the next year and was the second highest yearling purchase at the sale, also the second most expensive yearling in history at the time, to Sheikh Maktoum for $3.3 million. The Sheikh named the colt Shareef Dancer and then watched with pride as his expensive colt ran away with the Irish Derby in 1983. Shareef Dancer was a disappointing stallion but does have a place of pride as the broodmare sire of the great Dubai Millennium. Shareef Dancer’s name is in pedigrees of many good recent world class runners through Dubai Millennium’s marvellous son Dubawi, one of the top five stallions in the world today. Sir Ivor is also the broodmare sire of champion Irish sprinter Bluebird by Storm Bird. The dam of Bluebird is unraced Ivory Dawn. Bluebird was an early shuttle sire for Coolmore Stud in Ireland and Australia. Among the top winners of Bluebird’s get are Singing The Blues, Azzurro, Rainbow Blues, The Delegator and Flitter. Lady Rebecca by Sir Ivor, produced Alzao by Lyphard in 1980. Alzao was a two time stakes winner and then became a very reliable sire of stakes winners. Alzao got one hundred such winners in his stud career including Shahtoush, Winona, Alborada, and Albanova. Alzao is best known today as the sire of Wind In Her Hair, a direct tail female line descendant of Highclere. Wind In Her Hair is the dam of the great Deep Impact, a current top five stallion in the breeding world today. Perhaps the most important offspring produced by a daughter of Sir Ivor has been Green Desert. The dam of Green Desert is Foreign Courier, and daughter of not only Sir Ivor, but also of the great foundation broodmare Courtly Dee. Green Desert won some important sprint races, including the G1 July Cup, and has sired some impressive stakes winners. Desert Prince, Sheikh Albadou, Owington, Tamarisk, Markab, and Rose Gypsy are all G1 winners. Green Desert has become one of the leading sire of sires in the past thirty years. 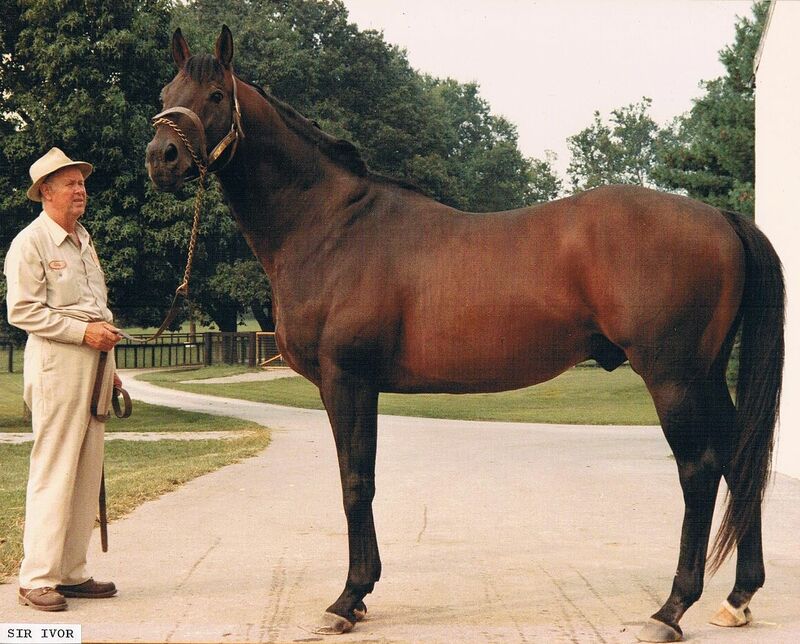 Green Desert was sired by Danzig, so is another of the very good Northern Dancer/Sir Ivor cross stallions that have made an impact on the world breeding scene. Green Desert is the sire of current top sires Oasis Dream, Cape Cross, Invincible Spirit and Volksraad. Other champion sires with the name of Sir Ivor up close in their pedigrees are Elusive Quality, Encosta De Lago, and Flying Spur. Sir Ivor is the sire of the second dam to Elusive Quality, the third dam of Encosta De Lago and the second dam to Flying Spur. The latter two are both from the Fanfreluche family. Clearly Sir Ivor has an enviable sire legacy with his daughters and their ability to not only produce stakes winners, but also stakes sires. But what of Sir Ivor’s sons? Well he had quite a few good ones to be sure, but really only one son to carry the male line forward, and this son was one of the most unlikely of his sons to do so. His name? Sir Tristram. Sir Tristram was bred in 1971 by Raymond Guest in Ireland. The colt was an incorrigible fellow almost from the time he first stood up and nursed on his mother. He was a headstrong “I’ll do it my way” sort, and he would challenge anyone who tried to teach him otherwise. Sir Tristram had a very disappointing racing career, winning only two of nineteen starts, and was not considered as a very good prospect for stud duties. Patrick Hogan, now Sir Patrick, of New Zealand was on the lookout for a stallion prospect for his Cambridge Stud. When he was surveying potential stallions, he was not shown to Sir Tristram, even though the horse was mere fifty feet away from him when he visited the farm Sir Tristram was at. Such was the opinion of the staff at the farm of the horse’s potential. It could have been that no one wanted to bring the horse out for view to avoid being savaged. Sir Tristram could scare the wits out of the most experienced handlers. Hogan would later spot the pedigree of Sir Tristram and despite his bloodstock advisor’s misgivings, would buy him sight unseen for his farm. The rest as they say is history. Sir Tristram would sire one hundred and forty stakes winners, became a leading sire six times in his career and established a tail male line trough his son Zabeel, on to Octagonal, and to the present day in Lonhro, which is a major sire line in the world today. Furthermore, Sir Tristram is the broodmare sire two-hundred more stakes winners. Major stakes winning sons of Sir Ivor are; Bates Motel (Santa Anita Handicap, Monmouth Handicap), St. Hilarion (Gran Premio d’Italia, Gran Premio del Jockey Club), Cavo Doro (Royal Whip, second Epsom Derby), Imperial Prince (Wood Ditton Stakes, second Epsom and Irish Derbies), Malinowski (Irish champion two year old), and National Hunt G1 winner French Holly (Christmas Hurdle). Sir Ivor was one of those rare horses that could pull anyone out of their seat with his breathtaking explosive acceleration. He could also turn heads with his attractive looks and was an endearing and sociable horse. Vincent O’Brien would say that Sir Ivor and Nijinsky were the two best he ever trained. Sir Ivor being the toughest and easiest horse to train of the two. Sir Ivor’s intelligence, was so acute that during his training sessions on the Ballydoyle gallops, he learned and recognised where the end of the gallop was, and would always power down once he and his exercise rider reached that spot. O’Brien would learn of this and if he needed a longer or shorter work from Sir Ivor, he would simply start the work from a different spot and have it completed at the point Sir Ivor was aware of. No need for exact instructions, since Sir Ivor would always and reliably finish his work at the precise point. Sir Ivor was pensioned from stud duty in 1990 and lived another five years at Claiborne. He is buried at Claiborne in the cemetery with many of the other greats who stood at the historic farm. His final totals of ninety-four stakes winners from eight hundred and four named foals equates to 12% of his entire foal count. He is the broodmare sire of one hundred and fifty-two more stakes winners. Sir Ivor was a memorable Thoroughbred. Blazingly fast, beautiful to look at, and very friendly and intelligent, his name lives on in historical fact and in the bloodlines of many champions. Thank you for this excellent bio about Sir Ivor. Learned much about this great horse. A very good article. This is a horse you could really love. Sir Tristram is dear to my heart, growing up down the road from where he stood; then his son Zabeel came to Cambridge Stud as his successor, who has achieved as much, if not more that Paddy; sadly Zabeel passed away last year. Zabeel’s son Savabeel (winner of the WFA championship of Australia, the WS Cox Plate) is the most likely to continue the successful sire line and is doing a great job, having to date sired 11 Group 1 winners. Yes He was a Great Race Horse and Sire A Note A Race Horse Has a Great Cent’s of Intelligence of a Very High Power and that is my own Opinion ?? ?..